EVGA emailed HEXUS a few hours ago to tell us all about its new GeForce GTX 970 HYBRID GAMING graphics card. It headlined the description "cooler than the competition" and highlighted the significantly lower GPU operating temperature that the hybrid liquid cooling solution (LCS) brings to the product. However the key question for potential buyers concerns the extra outlay paid vs the benefits gained. 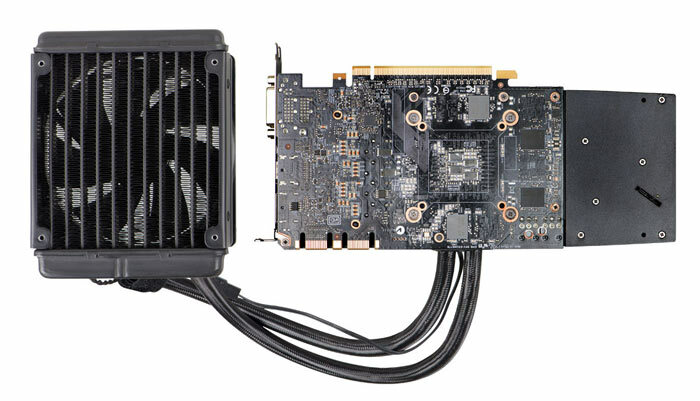 Is a regular blower-type cooler not a good enough solution for a GTX 970? 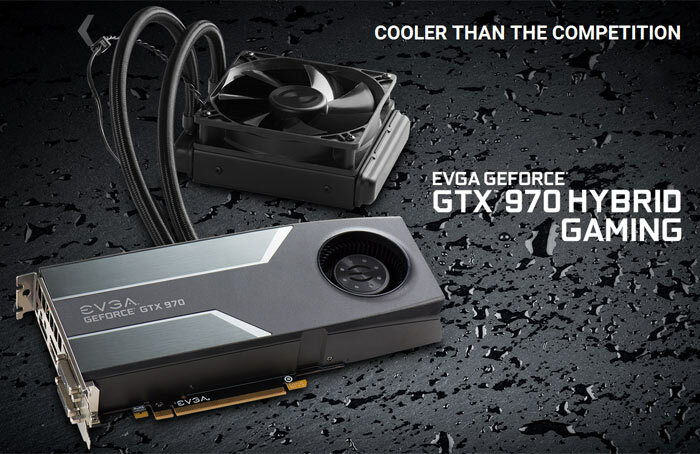 The EVGA GeForce GTX 970 HYBRID GAMING offers users a significantly lower GPU operating temperature thanks to the self-contained no-maintenance all-in-one hybrid cooler equipped. As with other members of the HYBRID series, it uses a copper contact base and runs 'virtually silent'. On the GTX 970 HYBRID the cooling block is partnered with a temerature responsive dynamically adjusting fan and a 120mm radiator. EVGA says its system also provides cooling for VRM and memory chips. Key comparative performance specs for the GTX 970 HYBRID GAMING are as follows; its GPU runs at base/boost of 1140MHz/1279MHz and its 4GB of GDDR RAM runs at 7010MHz. These are the same clocks as offered by the EVGA GeForce GTX 970 SC GAMING. 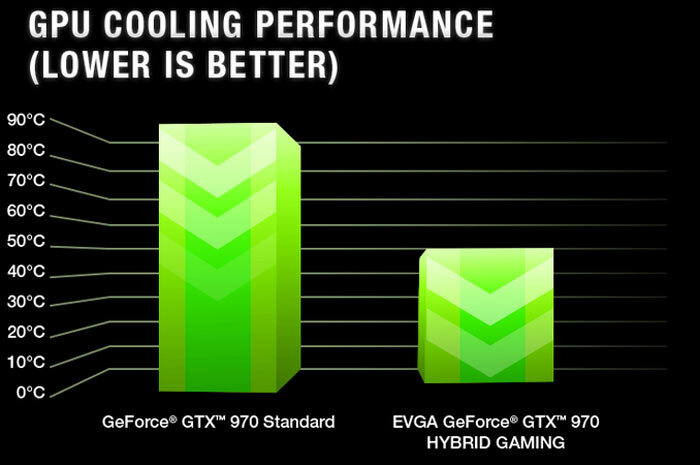 With the hybrid cooler one might have expected a more ambitious overclock straight from the box. If you look at the European pricing the new EVGA GTX 970 HYBRID GAMING card costs €469, that's €82 more than the EVGA GTX 970 SC GAMING card. Looking at overclocking, this is potentially where you will get the most mileage from your HYBRID GAMING card. As seen in the video below, the card was tested under full load with a GPU clock of 1367MHz, playing Tom Clancy's Rainbow Six Siege, while rarely venturing above 40 degrees C. It should also remain ' Virtually Silent' under these conditions. As someone who is considering a low end 970 this just seems pointless with 970 - A 390 maybe as it runs a lot hotter but not the 970. Seems like ‘big spoiler on a corsa’ scenario to me. More about showing off than giving any advantage.